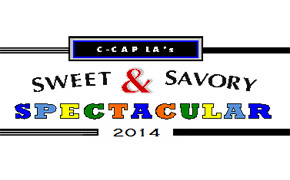 Eric Boardman continues his coverage of C-CAP’s 2015 Scholarship Awards for L.A. County. “Hard work, good grades, and a lot of broken eggs paid off for Hannah Chang of Hoover High School and Jose Gordillo of Manual Arts High School, who both received full-tuition scholarships in Culinary Arts. Jose will attend the Culinary Institute of America (CIA) in Hyde Park, NY and Hannah Chang will study at Johnson & Wales University in Providence, RI come fall. Isabel Castro of Carson High School received the Art Institute National Scholarship. Bricia Lopez, the engaging co-owner (with her brother and sister) of Guelaguetza in Koreatown is back with us. On May 4th she was in Chicago at The James Beard Foundation Awards at the Lyric Opera to receive the America’s Classics Award. This is an especially noteworthy honor as the Award for Guelaguetza was the only Beard Award received by a Southern California chef or restaurant this year. The America’s Classic Award is an honor given to regional establishments, often family-owned, that are treasured for their quality food, local character, and lasting appeal. Guelaguetza, founded by Fernando Lopez in 1994, is the center of Oaxacan life in Los Angeles, and the setting for countless quinceaneras, weddings, and anniversaries. A sprawling restaurant located in Koreatown, it features live music on a bandstand every night. Open for breakfast, lunch and dinner, the restaurant attracts both homesick Oaxacans and foodies in search of honest Oaxacan foods. Chef Christophe Bernard is the long-time Academic Director. The student run restaurant there is Bistro 31 with a dramatic floor-to-ceiling glass wall looking into the pristine kitchen. The restaurant provides the students an opportunity to practice the theory and culinary artistry they have learned and honed over the years in the culinary program. During the quarter usual hours are Tuesday through Thursday for lunch from 11:30 a.m. until 2 p.m. and for dinner from 6:30 p.m. to 9:00 p.m. Call for hours to be sure of the schedule and parking validation is available. Reservations are advised. It’s a bargain, too ! (310) 314-6057.